I am sorry to correct Shakespeare, but nothing is rotten in the state of Denmark. I should know—I just spent a few days there. True, I didn’t get into any of the deep, dark Danish secrets, the way Shakespeare did. But I did have enough exposure to be charmed by the Danish differences. Denmark has its act together. In today’s world, that’s different! 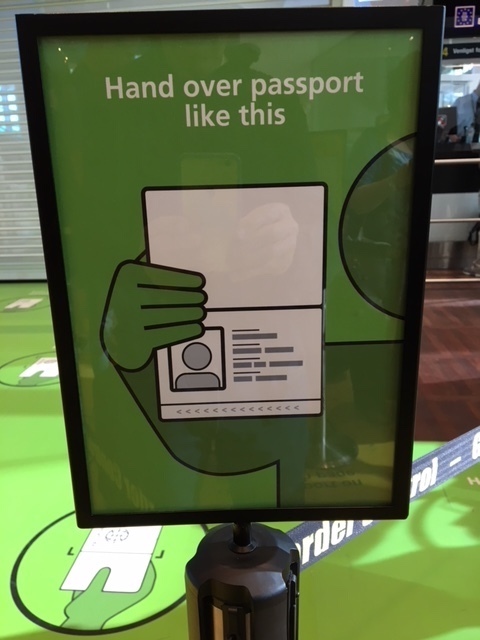 The first thing you see, as you line up at border control, is a sign that says “Find your passport”, then another that adds “Open passport on photograph page”, followed by a third that states “Hand over passport like this.” Charming… and telling. You’re not even in the country yet, and the stage is set: do your bit of personal effort for the collective good. Into Copenhagen you go, to find out that the prices are outrageous. That’s because the income disparities are not outrageous. I read somewhere that McDonald workers here earn about $25 an hour (they are unionized, like 70% of the Danish workforce), so they live middle class lives. Hence a Big Mac costs about a buck more than in the U.S. Is this too much to pay for inclusive democracy, let alone social harmony? You take a taxi and hand your credit card to the driver, who declares “no tip” as he enters the amount on the meter. No subordination here. No Uber either. Instead, bicycles, galore. The Danes discovered the obvious—that what is destroying almost every city on earth is more roads to accommodate more cars that attract more cars which require more roads. Instead of going with this flow, the Danes reversed it and brought back the bikes, favoring them in the city as well as installing paths for them in the countryside. In the capital, bikes can ride on some subway cars and buses, and parking for them is plentiful in the center. Hence 60% of Copenhagen commuters now go by bike, 46,000 of them daily across one bike bridge alone. The guy who designed that bridge says that Copenhagen has the most beautiful rush hour in the world! If you rent a kayak in the harbor for an hour, you pay nothing if you bring back a bucket of trash. Imagine that: imagination! In the hotel where I stayed, the carpet in the elevator tells you which way to go to your room. (Don’t we all stare down anyway?) More imagination. 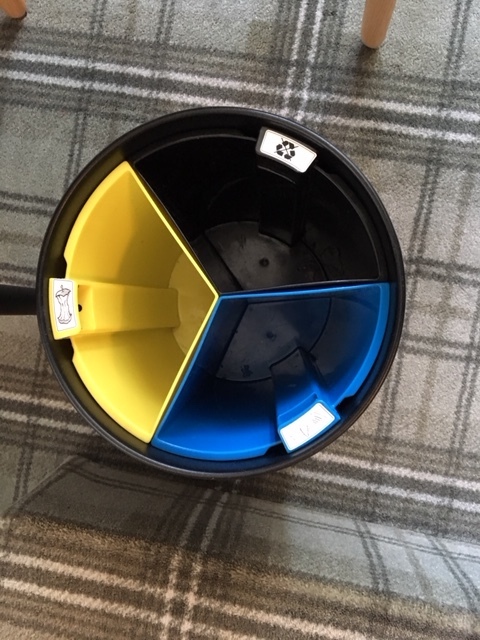 And then, in your room, you find a basket balanced across the three sectors of recycling. More soul too. We visit a war memorial for fallen Danish soldiers. It’s a subtle, simple place. The names of just over 100 soldiers are inscribed, and so are the 47 countries where they fell. Turns out this is to commemorate peacekeepers. How many countries have a memorial dedicated to the soldiers who fell for peace? Had I stayed a few more days, I’m sure I would have found something rotten in the state of Denmark. (Good thing I didn’t, for the sake of this title.) Maybe I would have found garbage that was rotten in the state of Denmark, or at least rotting. 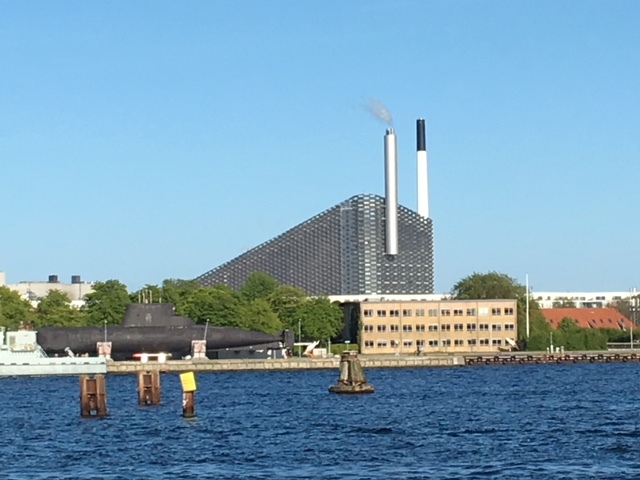 But then again, in Copenhagen they built a big incinerator to burn it—and, being Danish, they designed it with a long slopping roof, using some of the energy generated from it to make snow for the skiers of this flat country. Charming, so charming. In polls, the Danes come out as the happiest people on earth. Is this why they get their act together? Or is it because they have their act together? Yes. Helping all this along, the Danes keep the financial sharks at bay, so to speak: most of the major Danish corporations, such as Carlsberg, LEGO, and Novo Nordisk, are controlled by foundations. One figure put the number of such Danish companies at over 1300, with the publicly-traded ones comprising about two-thirds of the total market capitalization of the Copenhagen Stock Exchange.1 This can help them to do better for all, instead of grabbing more for the few. In 2015, the Harvard Business Review named the CEO of Novo Nordisk the best-performing CEO in the world… and he was one of the lowest paid among the top candidates! Does he suffer? Maybe he hides a Maserati in his garage while cycling to work, thus helping to keep the country in balance. Something is rotten in the state of the world. If the Danes can get their act together, how about the rest of us? © Henry Mintzberg 2018. My book Rebalancing Society was unintentionally written about the state of Denmark. 2See our article “Worldly Strategy for the Global Climate”, forthcoming in the Stanford Social Innovation Review in September.